There is a subtle understated elegance of intricate white thread embroidery on delicate white muslin. So uniquely exquisite is this fine creation that it has been applauded and desired for centuries. While the true origins of Chikan are shrouded in mystery and legend, it is clear that Chikankari has its roots in the Mughal reign. Although Chikankari has flourished and has been known to be associated with Lucknow for over two hundred years, it did not originate in this stately town. It flourished in the Mughal Court of Delhi in the 16th and 17th centuries. When the Mughal courts disintegrated the artisans scattered across the country. Some of them came and settled in Awadh. They brought this craft with them and gave it roots. Over the years, the craft has evolved. During the 18th and 19th centuries several Europeans settled down in Lucknow. Historians find a most unusual link between chikancraft and French white embroidery. It seems possible that French white embroidery had some influence on chikan. At this time there was another white cotton fabric being produced in Lucknow and Faizabad. This fabric was called Jamdani which was a very fine woven fabric of delicate texture and patterns of white on white and has a fine detailing of regular and irregular floral motifs .It is very possible that Chikan craft was inspired by Jamdani, the only difference being that Jamdani is woven and chikan is pure embroidery. True chikan has the unique property of being limited to a fixed repertoire of six basic stitches, five of which are common to other forms of embroidery. In all, chikancraft has 32 different stitches, that are used separately or in combination with one another. The six basic stitches are: Tepchi,bak Running stitch),Bakhiya (double back stitch),hool (Eyelet)’Zanzeera (chain stitch), Rahet (stem stitch) and Banarsi. 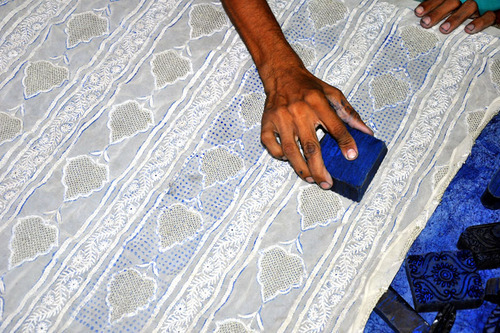 Over the centuries, this craft has faced its share of deterioration with increase in commercialization, artisans moving to other trades and lack of resources such as fine quality muslin. Over the past 25 years, the Central and State Government, organizations such as SEWA, the Self Employed Women’s Association have made valiant efforts to revive the craft, generate employment, ensure good wages, enable promotional channels and ultimately produce good quality chikan. 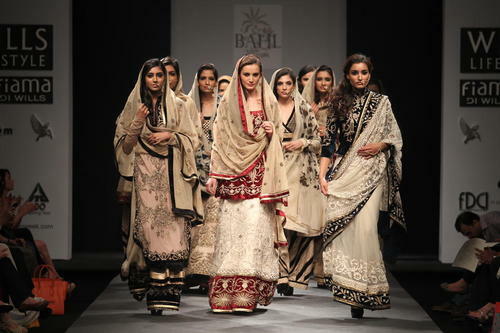 Several top designers have embraced the craft and helped give Chikankari it’s due global recognition. Today the Chikan workforce, made up largely of women, is adequately compensated for their efforts and for their aesthetic spirit of the beautiful whispering whites which they have restored to some semblance of its former glory. And a craft that has stood the test of time, it still remains as pure, delicate and desirable as ever. Posted in Crafts, Embroidery, History, Uttar Pradesh, Women and tagged 16th and 17th centuries, Chikan, Chikankari, Craft, Embroidery, Heritage, History, Lucknow, Mughal Court of Delhi, Muslin, Nawabs, thread embroidery. Bookmark the permalink.